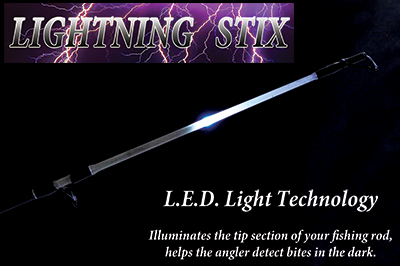 Lightning Stix offer the angler the advantage of L.E.D. Light Technology and illuminate the tip section of the fishing rod. This helps the angler to detect bites in the dark and low light conditions. Lightning Stixs are made from a specially designed composite Carbon and Fibreglass blank that are a thinner profile. This gives the angler a rod that loads and casts extreme distances and are lighter in weight. It also offers great strength and is sensitive to feel the lightest bites and improves the hook set. Lightning Stix also feature Split Butts, quality Graphite Reel Seats, Zirconia Carbide Guides, under and overbound Stripper Guide and Aluminium Winding Checks.